Just checking in. Things haven't changed much since the last update...although my mother-in-law is in hospice now. She has good days and bad days and we're trying to spend as much time with her as we can. I haven't been writing. Not that I don't have the time, time is there and I find myself looking for a good escapist movie to watch, or I'll scrapbook old baby photos or I'll....you get the picture. What I don't do is write. It's as if my Creative Muse has stepped back and said, "You go do what you need to do. I"ll just wait here. I won't abandon you, but right now you need to spend your mental energies elsewhere." You gotta love an understanding Muse. Diamond Submission is back in my hands - ready for editing. I will get to it this week as I get to it. It deserves my undivided attention. So does my mother-in-law. So does my 82-year-old uncle who still lives alone -- and shouldn't. So does my mother, who just turned 80 this week past - my mother who always thought she'd be dead by 70 because both her parents were. So it isn't a matter of time, it's a mater of mental capacity. I have a great Far Side mug where the cartoon is of a class filled with students and a kid raising his hand. The bubble over his head says, "May I be excused? My brain is full." Take care everyone, play safe and, with any luck, those of us in the Northeast will be able to stop shoveling snow soon! I teach two college classes -- Composition I & II. One of the assignements I give is to write a movie review. We all watch the same film in class (the students have to come to consensus on it - which is a hoot to watch!) and then they write reviews. I do the same, just because it's fun. Yeah, I'm a writer-geek and proud of it! Last year we watched Ironman and you can read my review here. Read on for this year's film review. I recently had occasion to view the semi-biographical movie, Catch Me If You Can. This movie, directed by Steven Spielberg and starring Tom Hanks and Leonardo DiCaprio, tells the story of the real-life adventures of Frank Abagnale, Jr. (DiCaprio), a con-artist and master forger and Carl Handratty (Hanks), the FBI agent charged with catching him. Steven Spielberg has experience telling biographical stories, having already done so with Schindler’s List. His strict attention to detail creates vivid images the audience will long remember. He brings that attention to detail to bear in this movie as well, from using period costumes and settings to the music playing under the scenes. But he goes further, delving deeply into the parts of the story where reality and truth don’t quite line up. Into places where realism plays against reality. It is when the film presents these moments that it truly shines and moves from the realm of just another popcorn movie into the category of excellence. Frank Abagnale, Jr. is a loveable con-artist. He’s debonair, intelligent, quick-witted and handsome. The audience cheers when he becomes the substitute teacher, loving the respect and obedience he commands from students his own age, simply because he’s dressed in a suit coat and tie and puts authority in his voice. That acting with authority is a huge part of a grifter’s repertoire and Frank wields it as like its natural-born talent. It isn’t, of course. He learned it from his father, Frank Senior. One of the first father-son moments in the movie is the father using the son to pull a con on a bank to increase his chances of getting the loan he so desperately needs. In fact, that scene is one of the first where reality and the truth don’t quite line up. Frank the elder wants to arrive at the bank as if he’s a big shot, so he scams a woman into loaning Frank the younger a nice suit so his son can pose as a chauffeur. They arrive in a fancy car and make a great show as if this need for money is a minor setback, nothing more. Neither of these two, the elder or the younger, like reality very much. They both prefer to live in a world of their own creation. Frank Junior continually attempts to get his parents back together, mostly by suggesting his father can win her back with things (a Cadillac or a trip to Hawaii, for example). His inability to accept this reality is tested again and again and it isn’t until he sees his half-sister in the living room window that he accepts the fact his parents are separated forever. Frank, Jr. would much rather live in the world he creates with his cons than in the real world as it is. We see this again at the very end of the movie when Frank accepts a job with the FBI. The day-to-day grind (symbolized by the stacks of files that workers pile on Frank’s desk) becomes tiresome and when Frank sees a pilot’s uniform for sale, he takes off. Literally. Only when Carl “catches” him at the airport and tells him look around, that no one’s chasing him, does Frank see another type of life. The thrill of the chase is done and over with. It’s time to face reality and he does. Frank Senior, on the other hand, never accepts reality. Sure, he accepts the inevitability of his divorce, but at his son’s expense. “Where you going, Frank? Someplace exotic?” is his mantra, the questions he asks his son each time he sees him. He lives vicariously through Frank Junior’s adventures. Even when his son doesn’t contact him, we are given no reason to believe he will change his ways. He’s blamed other people for his troubles for decades (the IRS is “after him”, “They have all the money,” “I wasn’t going to let them take it from me, so I closed it down.”) and we are given no reason to believe he didn’t go to his grave thinking his troubles weren’t his own fault. Spielberg shows himself to be a master of juggling multiple plot lines in order to tell one, straightforward, linear story. He uses flashbacks throughout the story to tell the story of this father-son relationship so the audience gets the backstory as to why the two are so out of touch with the harsh reality of their lives. We see his parents very much in love in happier times, we see the moment his mother moves out and we see the father confronted by the reality of what his son is doing. In every case, reality and truth don’t quite match. It’s this consistency that makes this a better-than-average film. Carl is the antithesis of Frank Abagnale, Jr. Where Frank thinks quickly on his feet, Carl becomes clumsy and flustered. Frank is smooth and debonair, Carl can’t even tell a knock-knock joke. Frank moves through a world of high class establishments, Carl works in a gray office filled with hard edges and difficult-to-use technology. Where Frank represents the dream, Carl embodies the reality. Spielberg skillfully juxtapositions these two characters throughout the film, jumping between the stories of each man as one chases the other. The most startling contrast comes when Frank is with the high-priced call girl in the very swanky hotel and Carl is in a dark, gray office lit only by the light of a single harsh light bulb. The dream vs. the reality shown in stark, visual contrast. However, Frank and Carl have similar disassociations with reality. Toward the end of the movie, we discover Carl is divorced and hasn’t seen his daughter in nearly two decades. This surprises Frank because Carl had earlier referred to as a little girl. Yet she is an adult. Carl justifies his lie by saying she’ll always be little to him because he has no memories of her growing up. Adding in this bit of information isn’t trivial. Frank and Carl eventually become lifelong friends; in order to believe that this could be possible, Spielberg needed to show us that it didn’t matter which side of the law they were on – the two men were more similar than different. It’s worth noting this character, even if she has a small role in the film. Brenda Strong (Amy Adams) is the woman who finally catches the heart of Frank Abagnale, Jr. For her, he decides to settle down, be one person—Frank Connors—and lead the life of a normal man. He crams for the Louisiana Bar exam and passes it, even though his courtroom style comes straight from Perry Mason. It is for her that he begs Carl to stop chasing him, to leave him alone now. Of course, Carl can’t do that. Laws have been broken and restitution must be made. Brenda ends up being used as a patsy to catch Frank, a ploy he sees through, escaping by using several of the techniques of the con he’s picked up along the way. But Spielberg makes us feel sorry for Brenda. She’s stuck in a hard place, having already been thrown out of her house for a mistake she made once before. She loves Frank, but one can imagine a scene not in the movie—a scene where her father presents her an ultimatum once more: help the FBI or move out of the house again. Even the way she stands on the sidewalk waiting for Frank shows us an unsecure, scared young woman. Because of Spielberg’s framing of the shot, we do not blame Brenda for being the bait, we empathize with her instead. John William’s music choices were spot-on for the film. “Embraceable You”, the song his parents dance to in their living room, is a wonderfully romantic song to set as background to the story of how they met and fell in love. “The Girl From Ipanema,” a light, frothy song played during the segment at the Tropicana Hotel, changes to the chase music when Carl realizes his unsub is still in the building, clueing the audience in that something is afoot. In fact, this chase music, a clarinet melody played in short, quick notes, is set up during the film’s opening sequence, where the entire story is played out in stark shadows. It returns each time Carl gets a clue and moves a step closer to capturing Frank: when the waiter gives him the comic book clue and he realizes the person he’s looking for is a kid, at the father’s apartment when Carl notices a return address for Frank, at Frank’s mom’s house when Carl sees Frank’s picture in the yearbook—and again at the engagement party when they miss Frank by only a few seconds. The skillful use of this audio clue continues to build excitement in the audience. Stephen Spielberg’s movie, Catch Me if You Can, might be about a criminal, but it is entertaining. He skillfully interweaves the lives of these characters, using the contrasts of reality and truth to tell a story about three men who, despite their differences, also have many similar traits. Through the use of realism in his movie, we believe these people are real and that their lives are well-represented. A good movie that's better than an average popcorn flick! NOTE: According to Wikipedia, all three actors playing Frank, Jr. in this segment were actors. Please welcome Nancy Corrigan as our guest blogger today. She's talking about the use of body language to express emotion in a scene. Something too often overlooked! I love using body language to build my story. Partially, this stems from my joy of people-watching. So much can be learned from how people interact with others. Here’s a little snippet from my latest release to show how Devin expresses his feelings. He reached up and ran his long fingers through the patchwork hair. The strands fanned with the movement, settling against his shoulders. With the second sweep through the locks, he yanked handfuls of the colorful hair, a groan accompanying the rough tug. She dropped her gaze before she gave into the urge to ask if he was all right. Her fascination with him wasn’t healthy. Outward appearances didn’t make the man and this one was a dangerous predator. Big cats did not make good cuddle buddies. She pushed her body into a sitting position. The movement tugged her abused stomach. Preparing for the worst, she glanced down and didn’t see what she’d expected. Instead of a bruised and beaten body, she saw her familiar tanned skin—blood free, without any ugly black and blue splotches. Her shoes had been replaced by a pair of large socks, the tops rolled down to help them stay on. Scratches marred her legs from the edge of her exercise shorts to her feet but none were bandaged nor did they need to be. The only square of gauze covered the wound on her belly. He tensed and rubbed one of those big hands over the back of his neck but didn’t turn around. She glanced away when it became apparent he wasn’t going to answer and ran a finger over a splotch of shiny new skin on her knee. Anxiety settled in her bones. A lot could happen in a matter of days. Now, Devin’s upset, guilty and stressed in this scene. He’s the one who caused Lena’s injuries and he feels horrible for his actions. So, what are his body language clues? He runs his hands through his hair and yanks on the strands to portray his frustration, groaning as he does so. Rubbing his neck is an automatic response to his guilt, but it’s his inability to look at her which drives it home. He folds his arm against the wall, defeated and shamed while he admits that his actions left a permanent mark on the woman who will end up saving his soul and his mind. Okay, time to review your own writing. Go back to your current wip and take a look. Where can you add in body language? Any words you can take out and express through a character's action instead? I know this is something I struggle with. With my theatre background, I tend to focus on dialogue and figure the reader can fill in the details. This is fine when I'm writing a play where the actors like to have some wiggle room for their own interpretations. But romance readers want to be able to see the scene in their own imaginations. And body language is a great way to help them do that. Try it. Take a scene that needs some beefing up and, instead of concentrating on the dialogue, add in movement, stance, gestures. Go overboard. You can always pull back later. Last year at this time I wrote a post about how I tend to write non-fiction when life gets in my way. There must be something about the month of March because I find myself in a similar place today. I called this post "The Sandwich Generation" but I have to admit, I didn't truly understand that term until recently. 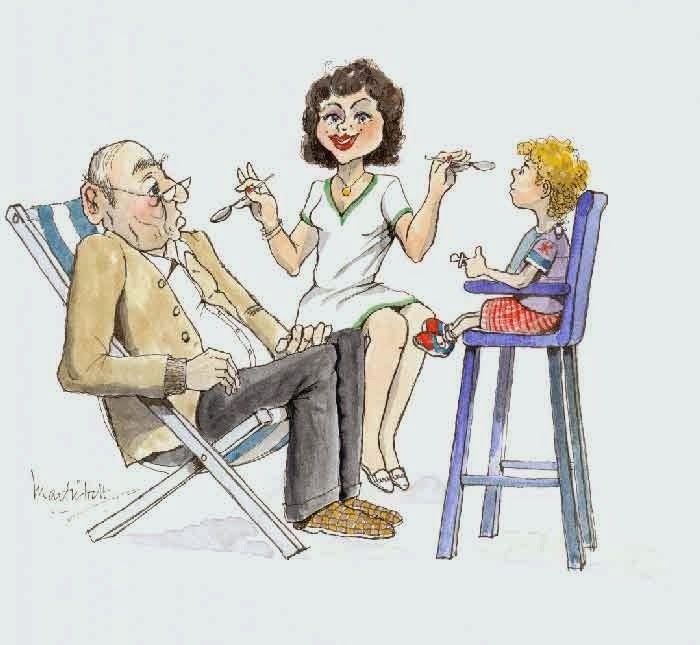 A relatively new term, it refers to those who are both raising children and taking care of elderly parents. When life expectancies were short, this situation didn't arise very often. Today, with the wonders of modern medicine, people live longer, more active lives. And this has led to the sandwich. My parents moved to a senior citizen apartment complex in December (read a little about the move here) and that brought stresses that now, for the most part, are gone as they've settled in and found new routines. At the same time, my adult children were making decisions about their own futures and needed advice and nurturing. Who comes first, the parents who raised me? Or the children I am raising? Perhaps the sandwich metaphor isn't right. Maybe the fulcrum of a teeter totter is more appropriate. The trick is to balance both sides and not get worn down in the middle. And now it's two other elderly family members who need our assistance. My husband's mom has taken a turn for the worse lately. Yes, the same mom we thought had only a few months left last year. She's been amazing. Told she had only a few months left, she made plans, threw herself a going away party, and got ready to leave the world. Yet here she is, a year later, defying the odds and baffling the doctors. She's more bed-ridden than not, however, and several falls have taken their toll. She now needs round-the-clock care and the family is trying their best to cover all the hours of the day. And I have an uncle, who also still lives alone, who is showing some signs of dementia. He never married and has no children of his own, but he was my favorite uncle when I was a kid. Because he physically lives closest to me, his care falls on my shoulders. I don't mind, please don't think this is a complaint. It's the way things are and I'm having fun learning new things about him. He's always loved to tell stories about things he's learned and I love hearing them. I always have. But I'm definitely feeling stressed. Why? Because in the midst of this, my son has become engaged. I want to give him and his fiancee their time in the sun as well. My daughter is looking to start a new life, too, with a new job and new career path (although she's still in love with stage management, should any of you be looking. She's also an incredibly gifted stage painter). Both my children still live at home and I cherish these last few months as a family of four + two. So sandwich or fulcrum...I'm either getting squished or worn down. Both negative metaphors. But I'm not a negative person. I prefer the glass to be half full. I like the sunny side of the situation. I need a new metaphor. A bridge. Bridges are strong and useful. They bring people together and provide opportunities for people on one side to learn and grow from those on the other. They are static, stable and pretty (at least MY bridge is! That's my story and I'm sticking to it.). Some bridges are sleek and new, others are old and traditional. 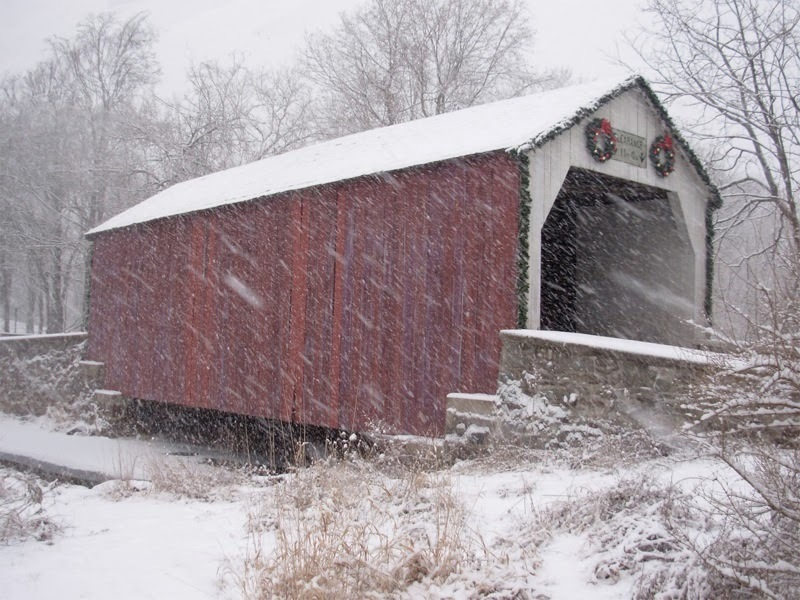 I think of myself as a covered bridge - a little on the old side, but picturesque and still in use. The roof protects, the planks are sturdy, the way is clear. So if my writing on the blog isn't as regular, if you want a reason I haven't sent a newsletter out since October, if you want to know why my next book is delayed... know that I'm busy being a bridge right now. I'll get back to my regular activities soon enough. Perhaps too soon. Hey folks, quick post to let you know my mother-in-law has taken a turn for the worse and I won't be posting for a bit. She requires round-the-clock care and the family's taking turns being with her. Keep her in your prayers, if you will. I'll be back as soon as I can.